We’re dedicated to providing our customers with simple, affordable and quality communications. Below you will find our range of great value mobile plans, if you have any questions don’t hesitate to call our friendly, locally based Customer Care team! Ultimate Plans Big inclusions at tiny prices! Connect Plans Plans from just $9 per month! Our Ultimate plans give you more. Unlimited talk on all standard calls within Australia including 13, 1300, 1800 and voicemail retrieval, unlimited text for all standard SMS and MMS from Australia to anywhere worldwide, plus BIG data! Our Connect plans allow you to talk, text and browse online for less. Use your included value for standard calls, 13/1300 calls, voicemail retrieval, calls to Australian mobiles and international calls as well as SMS and MMS. Plus talk all you like to any other Reward Mobile and pay no extra! Our Mobile Data plans give you the freedom of data-on-the-go! Choose from Reward Mobile’s month-to-month Mobile Data plans for huge data inclusions at tiny prices! Min cost is $216 over 24 months. Min cost is $456 over 24 months. Min cost is $696 over 24 months. Min cost is $936 over 24 months. Min cost is $42.95 over 1 month. Min cost is $1318.80 over 24 months. Min cost is $1558.80 over 24 months. Min cost is $9.90 over 1 month. Min cost is $15 over 1 month. Min cost is $30 over 1 month. 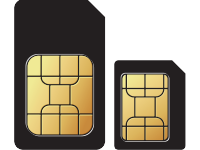 Standard SIMs are used by older mobile phones, as well as most tablets and mobile broadband modems. Micro SIMs are used by some newer mobile phones and tablets. Suits some new models including the latest iPhone models. Includes both the Standard and Micro SIM. Suitable for most mobile phones.